The six Rotary Clubs in Thanet were asked if they could help give four year old Abigail Smith, from Ramsgate, a really special day out. Abigail suffers from Cerebral Palsy and Microcephaly and has battled steadfastly through her short life to do the things other children do and, now that she can walk with assistance, has been able to start school this September. 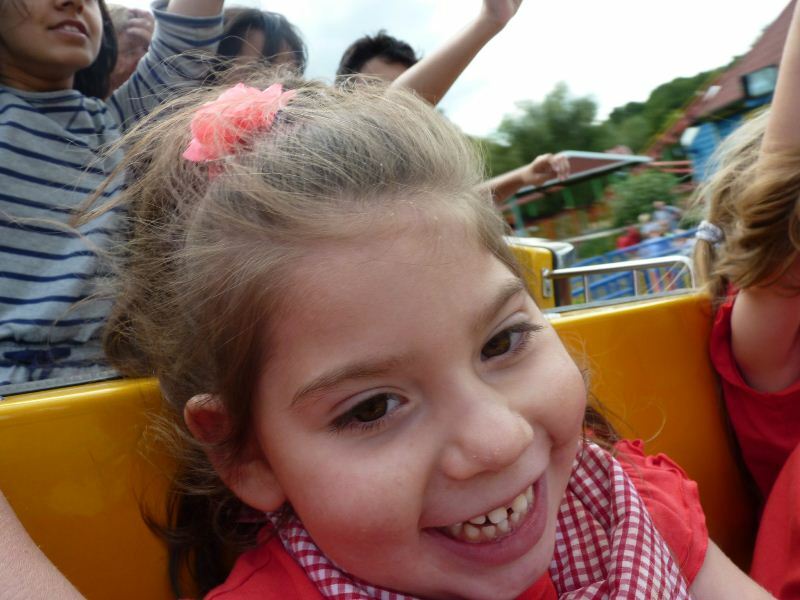 Abigail is a dedicated “Peppa Pig” fan and the Rotary Clubs worked together to send Abigail and her Mum, Kerry, to Peppa Pig World at Poultons Park in Hampshire together with a party of friends. They travelled in a small coach provided by Carol Peters Travel and after lots of songs, sweets, fun and games the very excited children arrived ready to meet Peppa, George and all the other much loved characters. They went for a drive in Daddy Pig’s car, loved George’s Dinosaur Ride and visited Grandpa Pig’s house. They met Suzy Sheep, Zoe Zebra and Rebecca Rabbit and even went for a ride in Miss Rabbit’s helicopter! They joined Peppa’s family having their tea and then went on Grandpa Pig’s Train (called Gertrude) singing all the songs from the show. This will be a treasured memory for Abigail and her family as she prepared to start school, where she is now getting on famously trying out her walker and other new equipment to help her achieve the brilliant progress she deserves to make given her steadfast determination to overcome her difficulties. Thank you to all Rotary members in Thanet, to Carol Peters Travel and Peppa Pig World for their generosity in treating Abigail to a truly magical day out! This entry was posted in Rotary Club of Westgate & Birchington. Bookmark the permalink. Well done, I really think the blog is going well, Randa.